Tim Atkin MW is a UK wine journalist with an international following. He writes for Harpers, Decanter, Gourmet Traveller Wine, Jamie Magazine and Imbibe and has own, award-winning website, timatkin.com. He also has a second career as a photographer whose photos have been published in The Guardian, The Daily Telegraph and the World of Fine Wine and exhibited in London, Provence, Poland and Lebanon. Tim is the winner of many awards, including the Glenfiddich Wine Writer Award in 1988, 1990, 1993, 2004 and 2006 and the Wine Guild of the United Kingdom’s Wine Columnist of the Year in 1991, 1992, 1994 and 1996. In 1994, he was the first recipient of the Wines of France Award. The following year he was the co-winner of The Bunch Award, described by Auberon Waugh as the “Booker Prize of wine writing”, and the winner of the Waterford Crystal Wine Correspondent of the Year Award. In 1999, 2002, 2003 and 2004 he was named Lanson Wine Writer of the Year. Also in 2002, he was highly commended in the PPA Editor of the Year (Business and Professional Magazines) category for his work in transforming Harpers, the UK trade magazine he edited between 2000 and 2003. In 2005 he won the inaugural Wines of Portugal Award. In 2007 he was named Communicator of the Year by the International Wine & Spirit Competition and Best Drink Journalist in the World Food Media Awards. In 2009 he was highly commended in the Columnist of the Year (Business Media) category in the PPA Awards and named Louis Roederer International Wine Columnist of the Year. In 2011, he won the first Born Digital Award for editorial content on timatkin.com. At the 2011 Louis Roederer Awards, his website was named International Wine Website of the Year, an award he won for a second time in 2013. In 2012 he was named as one of Wine Intelligence’s 10 for 10 (the people who had made a positive and lasting impact on the wine industry). In 2014 Tim won the Online Drink Writer of the Year Award at the Fortnum & Mason Awards, the Louis Roederer Online Communicator of the Year Award and the Harpers’ French Wine Awards Best French Wine Writer/Critic Award. In 2015, he won the Louis Roederer Feature Writer of the Year Award. In 2016, he was given the Premio Memorial Víctor de la Serna by the Real Academia de Gastronomía for his services to Spanish wine. In 2018, he won a sixth Roederer Award as Online Communicator of the Year. Tim has contributed to a number of books on wine, including the New World of Wine, as well as writing two of his own – Chardonnay and Vins de Pays d’Oc. He was also the co-author with Anthony Rose of five editions of the annual consumer guide, Grapevine. He has judged wines in the UK, France, Italy, the United States, Argentina, Spain, South Africa, Chile and Australia and is co-chairman of the London-based International Wine Challenge, the world’s biggest and most rigorously judged blind tasting competition. He is also the chairman of the Wines from Spain Awards and the Languedoc-Roussillon Top 100. In 2010 he was the international judge at the Melbourne Show and the Hong Kong International Wine & Spirit Competition. He is also a member of the panel that chooses the annual Top 50 Italian Wine Awards and judges the Cellars in the Sky Awards, assessing the wines listed by airlines in First and Business Classes. Tim is widely respected for his amusing and often controversial presentational style. In 2010 he was the keynote speaker at the Fine Wine Conference in Ribera del Duero and moderated a panel on emerging markets at the Masters of Wine Symposium in Bordeaux. Over the years, he has lectured to banks, firms of solicitors, singles’ evenings and numerous wine associations and clubs, specialising in the wines of France, Spain, Italy and the New World. 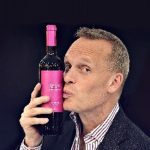 He is also one of the Three Wine Men (with Olly Smith and Oz Clarke), co-hosting half a dozen consumers weekends each year in the UK. Tim enjoys collecting and taking photos, golf, running, singing, reading and cooking and speaks fluent French and Spanish. He holds a BA from Durham University in Modern Languages and a Masters (with distinction) from the London School of Economics in European Studies. In 1993 he was a European Union fellow on the Paris-based Journalists in Europe programme. In 2001 he passed the notoriously difficult Master of Wine examination at the first attempt, winning the Robert Mondavi Award for the best set of theory papers. He is a Caballero del Vino, a Chevalier du Tastevin and a member of the Ordre du Bontemps in Bordeaux and the Cofradia de Rioja.